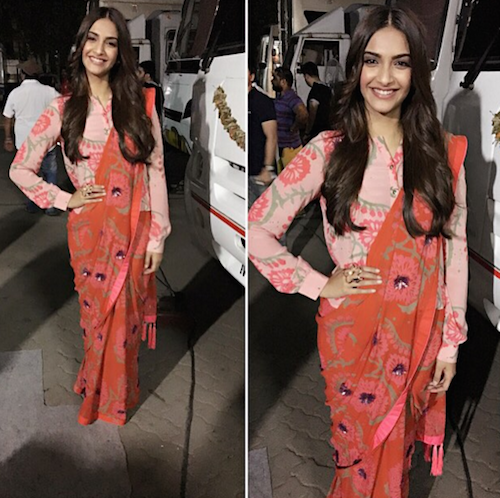 10 Amazing (And Different) Ways To Style The Same Old Sari! Saris are evergreen, they will absolutely never go out of fashion. 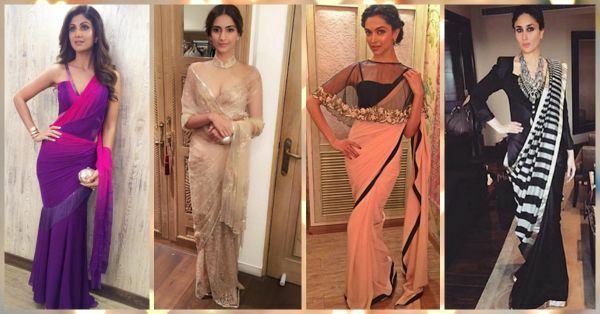 These celebs show us just how to remain in vogue by experimenting with their sari style! These are our favorite picks! Go on and see if you’d like to give these unconventional ways a shot! 1. The Golden Sheer Beauty! 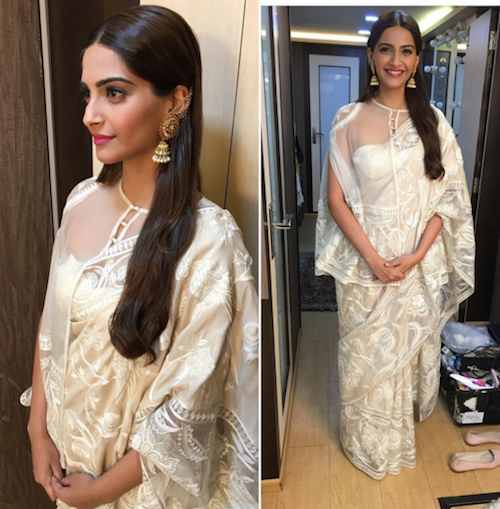 Sonam Kapoor is a pure diva when it comes to wearing the most unconventional outfits. She loves wearing saris and finds the most interesting ways of wearing them. In this Tarun Tahiliani sari, she opts for a sheer collared blouse with embellishments, showing just the right amount of skin. The way she’s gracefully draped it around her arms makes us go ooh-la-la! 4. The Glorious Cape Style! 5. The Long And Short Of It! Kalki rocks this offbeat Nikhil Thampi sari look in the most amazing manner. Just look at how she stands tall and confident wearing this plain black sari tucked in and pleated way above the ground. The shiny gold leggings showing underneath makes this one very edgy and daring! That kamarbandh completes the look satisfyingly. 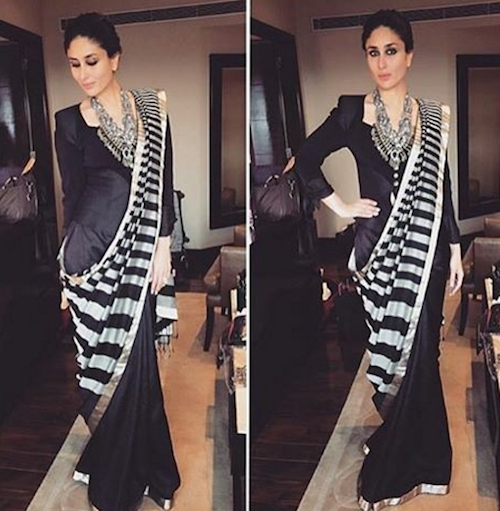 You can try this with any plain sari, just tuck in more of it to make it calf length! 6. The Blingy Blissful One! 7. The Smart Casual Sari! 8. The White Cape Princess! 9. The Exaggerated Ornamental One! This timeless charmer looks ever so sophisticated in this Tarun Tahiliani attire. It’s like lots of shimmer, lots of flare and just the perfect amount of intricate embroidery. The trick to getting this lovely outfit is wearing a lehenga sari, or getting kalis attached to the sari in place of pleats. 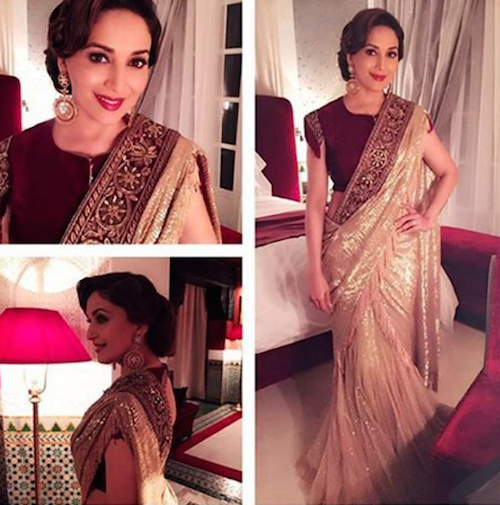 Madhuri truly knows how to rock the sari game!